"People keep giving me rings -- but I think a small Death Ray might be more practical." In a World where the Industrial Revolution has turned into all-out war, Mad Scientists rule the world. Badly. 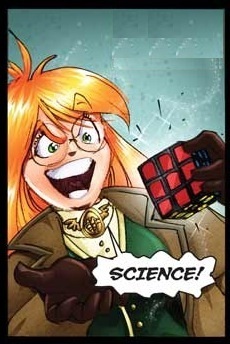 Girl Genius is a Web Comic (originally a print series) by Phil and Kaja Foglio, which has become one of the classics of the Steampunk (called Gaslamp Fantasy by the creators) genre. The title character of the story is Miss Agatha Clay (Heterodyne), who begins as a young apprentice to a type of Mad Scientist known to the world as a "Spark". Her adventures span over 16 volumes so far. Can be found at the Studio Foglio website, accessible through this elegant and finely-crafted link. An archive of the comics that were online as of May 4, 2016 can be found at the Library of Congress; accessible through this elegant and finely-crafted link. Please note here, "We recommend Girl Genius for an audience of teens and up". Was also the winner of the Graphic Story Hugo Award for three years running (2009-2011). There are also novelizations of the comic's first two major arcs, called Agatha H and The Airship City and Agatha H and The Clockwork Princess respectively. A GURPS adaptation has been licensed, but seems to have descended into Development Hell - that book hasn't even been outlined as of November 2016, let alone written. Look over the Girl Genius character sheet, or talk about the comic in our discussion thread for Girl Genius. Girl Genius follows The Wiki Rule, of course; their wiki is on Wikia. This page was last edited on 20 November 2018, at 14:51.